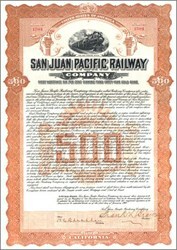 Beautifully engraved Gold Bond certificate from the San Juan Pacific Railway Company issued in 1908. This historic document has an ornate border around it with a vignette of a train ( SJPRR No. 208 ) above the words " The Old Mission Route". This item is hand signed by the Company�s President ( Frank L. Brown ) and Secretary and is over 102 years old. The San Juan Pacific Railway was operative May 4, 1907 and provided rail service from the San Juan Portland Cement Plant to the Southern Pacific at Chittenden. 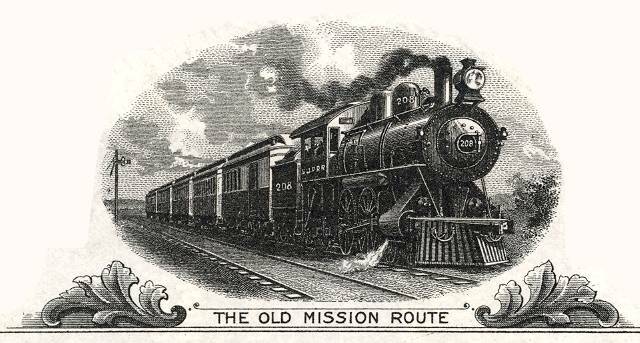 The San Juan Pacific Railway was operating a seven mile line, the Mission Route, to San Juan Bautista. They planned on expanding their line to Salinas, Hollister and Watsonville.